Two men have each been jailed for eight years for killing a 44-year-old man and then dumping his semi-naked body in a lift in a block of flats in Edinburgh. 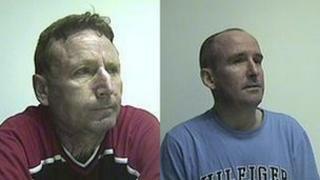 Simon Brown, 41, and Paul Banks, 48, dragged John Carter out of a flat in Salamander Court after attacking him. Brown and Banks were originally charged with murdering Mr Carter on 26 or 27 February last year, but admitted a reduced charged of culpable homicide. Mr Carter's family said nothing could fill the huge gap left in their lives. The men were sentenced at the High Court in Glasgow. A statement from the Carter family said: "First of all we would like to thank everyone involved in bringing these people to some sort of justice, however nothing can lessen the heartache that we have gone through because of this devastating loss. "John was a vibrant, fiercely intelligent, loving man, who brought countless joy to the lives of his family and many friends. "His laughter, his kindness, his ability to accept individuals for who they were and his inherent sense of fairness, were just a tiny part of who he was." It continued: "If John could help, he would. Nothing can fill the huge gap that has been left in our lives. "Rest in peace John. We will always love and miss you." Brown and Banks pleaded guilty to killing Mr Carter by placing handcuffs on his wrists, attacking him, placing him in a lift and failing to seek medical attention. They also robbed their victim of his wallet and its contents. Temporary judge Michael O'Grady QC told the pair: "Between you, you inflicted a deliberate death on a vulnerable and defenceless man. "You behaved with extreme cruelty and utter indifference. "No sentence I can impose can ease the ordeal of Mr Carter's family." Judge O'Grady said that if it had not been for their early plea he would have jailed Brown and Banks for 10 years each. The court was told that Mr Carter was openly gay and began chatting to the accused, whom he had never met before, in the Port O' Leith pub. The court heard that Banks left the pub alone and Brown and Mr Carter followed a few minutes later. Mr Carter was heading off to his home at Cable Wynd House, Leith, when Brown invited him to the flat he shared with Banks for a drink. Det Ch Inspector Sara Buchanan, of Lothian and Borders Police, said: "Whether their intention was to kill Mr Carter or not, both Paul Banks and Simon Brown were responsible for inflicting serious injury upon him. "As a result of these injuries, their victim died alone within an elevator and was denied any form of compassion or dignity in his final moments. "The pair's guilty plea earlier this month spared Mr Carter's family the ordeal of a trial. "However, this does not undo the suffering they have experienced as result of this incident."